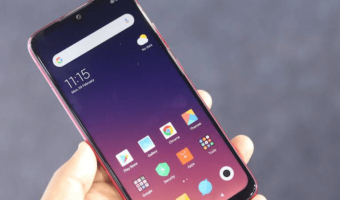 Telecom operators in India are fighting against each other in India for the top position- whether it be data speeds or tariff plans, all the operators are at the top of their game. Trai’s MySpeed application has revealed the data collected by the operator in August 2017. There are not many noteworthy changes to the list when it comes to download speed, but the upload speed list has some differences. For the eighth consecutive time, Reliance Jio has been rated as the India’s fastest LTE network with an average download speed of 18.433 Mbps. Following Jio are Vodafone, Idea, and Airtel with an average speed of 8.999 Mbps, 8.746 Mbps, and 8.550 Mbps respectively. 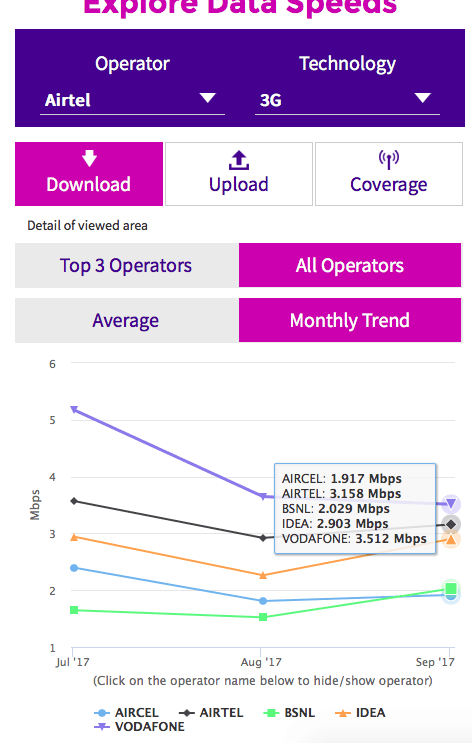 Reliance Jio saw a marginal increase in the download speed in August 2017, whereas Airtel lost its second place it achieved in July 2017 losing close to 1 Mbps average speed. In the average upload speed segment, Idea Cellular became the leader with 6.307 Mbps average upload speed in August 2017. 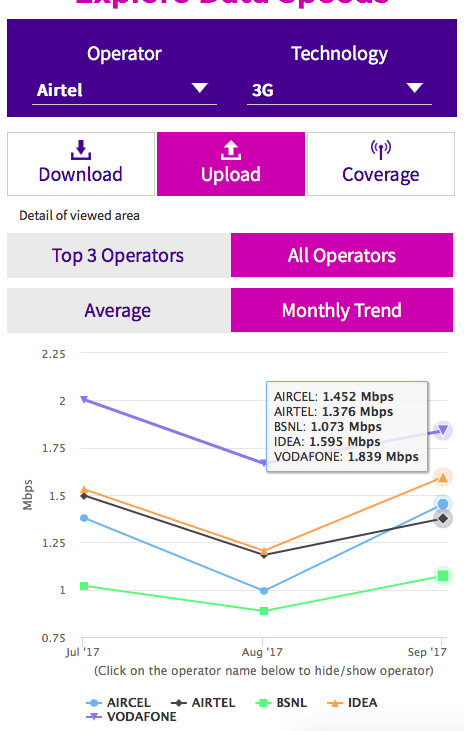 Vodafone India is in the second position with 5.776 Mbps average upload speed, which is followed by Reliance Jio with 4.134 Mbps and Airtel with 4.088 Mbps. 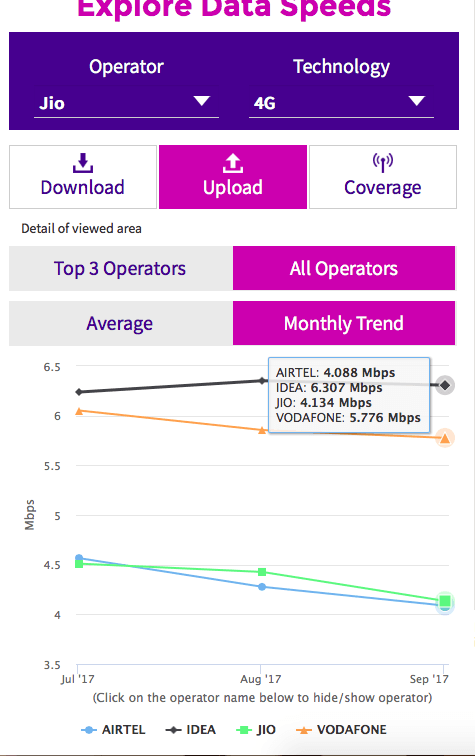 Coming to the 3G download speed department, Vodafone India is the winner with an average download speed of 3.512 Mbps, closely followed by Airtel with 3.158 Mbps and Idea Cellular with 2.903 Mbps. BSNL and Aircel are fourth and fifth on the list with 2.029 Mbps and 1.917 Mbps speeds respectively. Lastly, we have the average upload speeds in 3G technology. In this segment, Vodafone and Idea are first and second operators with 1.839 Mbps and 1.595 Mbps respectively. 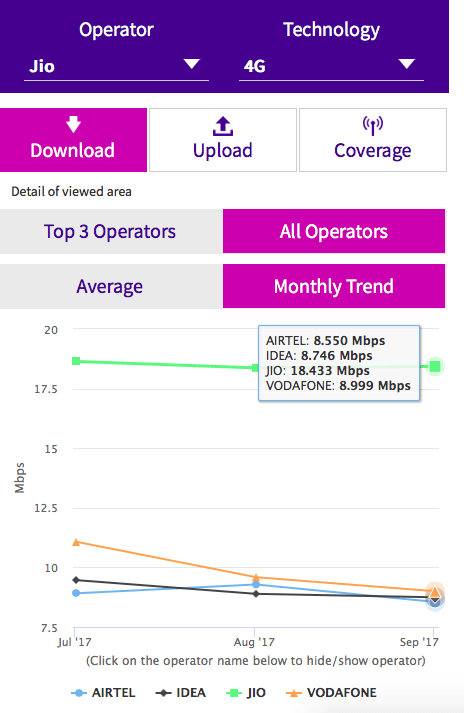 Bharti Airtel’s average 3G upload speed is 1.376 Mbps, which is less than that of Aircel’s 1.452 Mbps. BSNL is last in the list with an average upload speed of 1.073 Mbps. As you can clearly see, Reliance Jio is the leader in the 4G download segment with data speeds double than what incumbent telecom operators achieved. Trai recently gave a consultation paper on MySpeed app, whereas the regulator is seeking help from Ookla and others for a methodology of the application. The data goes against logic as airtel has far better spectrum portfolio than Vodafone or idea to enhance capacity and speeds…..I guess the full effect of additional bands is not yet seen. I reckon 5G is the answer. Plain and simple!